Some builders have a distinct style you see in all their bikes, Rob Chappell of Origin8or is not one them, he can take the same two bikes and deliver totally different builds, the one constant however is always quality. 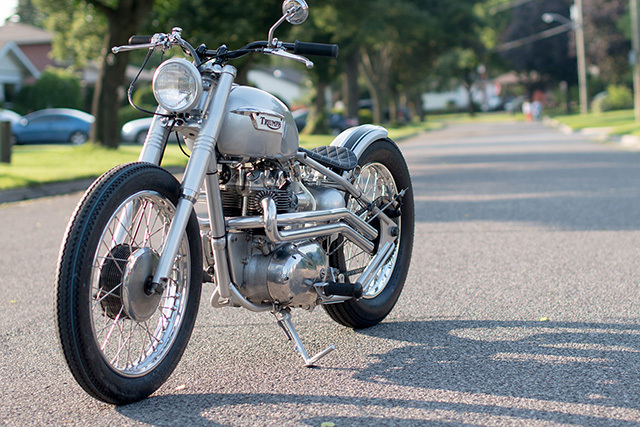 Just six weeks ago we featured another Triumph Bobber build by Chappell, a springer wearing, orange flake painted Bonnie that screamed look at me. 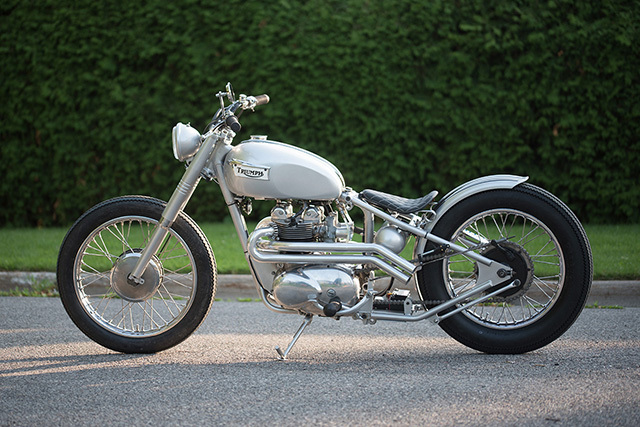 But this 1968 Triumph Daytona 500 is an example of how less can be more and custom cool can still stay true to classic style. Like any high end restoration and rebuild of a vintage vehicle, either car or motorcycle, this is a full frame off build with absolutely every part removed and stripped down. 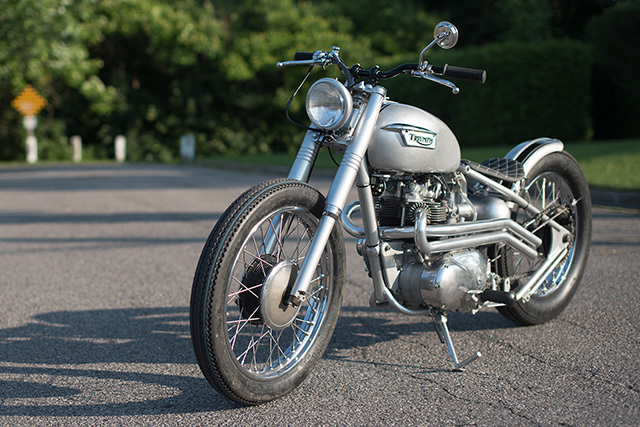 To give the classic bobber look Rob fitted the frame up with a The Factory Metal Works 4 inch stretched and 2inch drop hard tail. The frame, suspension components, pedals and the various bits and pieces that keep them all together were sent off to be sandblasted before being treated to some silver powder coat for a durable and clean finish. 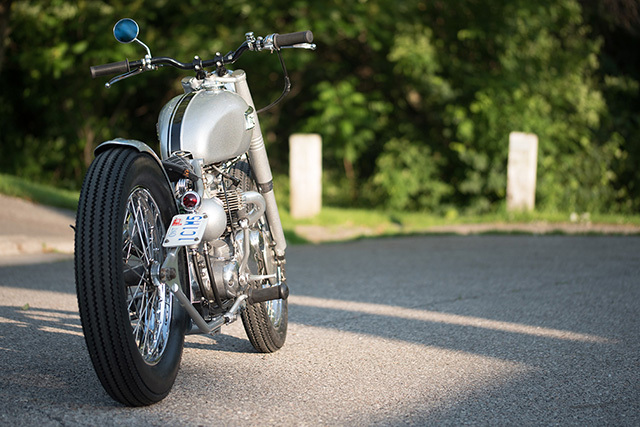 One of the few matching features to the previous Triumph bobber build is the timeless rear fender, narrow and shortened to display as much rubber as possible. The engine fitted to Triumph’s Daytona is a special little beast, designed to take on the Japanese at the Daytona International Speedway. 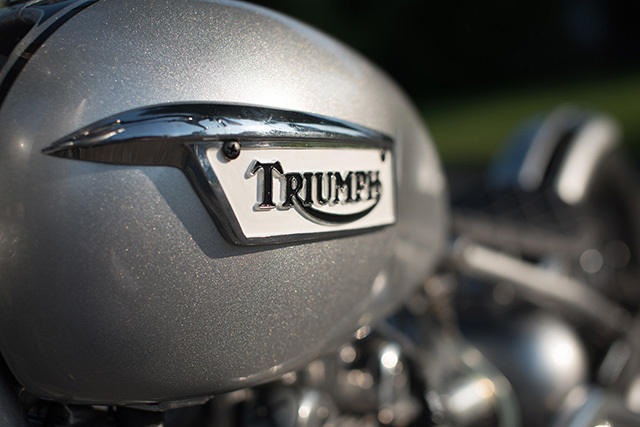 When Triumph won the 1966 Daytona 200 race with American Buddy Elmore aboard the Daytona name found its home on the Triumph the next year and a race winning average speed of nearly 100mph tells you this little thing can get up and go! The 490cc parallel twin engine featured new heads and twin AMAL Carbs for more top end power, both of which have been rebuilt by Rob. In fact the whole drivetrain has been rebuilt, not a bad decision when it was discovered the previous owner had used what looked like axle grease as their lube of choice for the transmission. Rob was nearly finished piecing together the rebuilt lump when he discovered the “full gasket kit” he’d bought didn’t include a head gasket, more than a minor issue. But a few emails and a two hour trip to a vintage bike show at a flea market, turned up just the right item and the rebuild was completed. 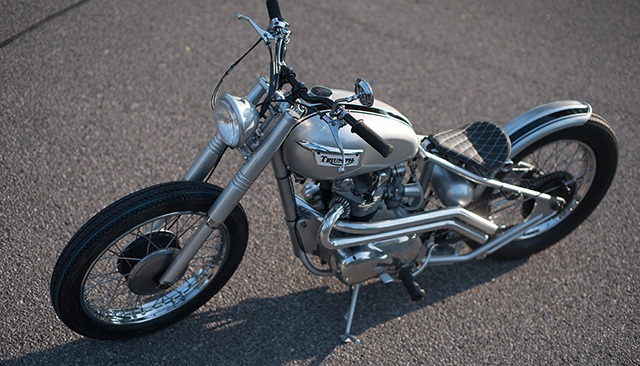 An engine this good deserves an exhaust to match and on a bobber the pipes become part of the look. With straight right side pipes on the last build Rob ran the twin pipes on the left side on the Daytona that are bent down and kinked slightly out to clear the oil tank. What makes Chappell such a great builder is his eye for detail, not only are the pipes ceramic coated to avoid pipe burn and an adverse effect on the oil temp the downward bend of the pipes exactly match the lines of the hard tailed frame. 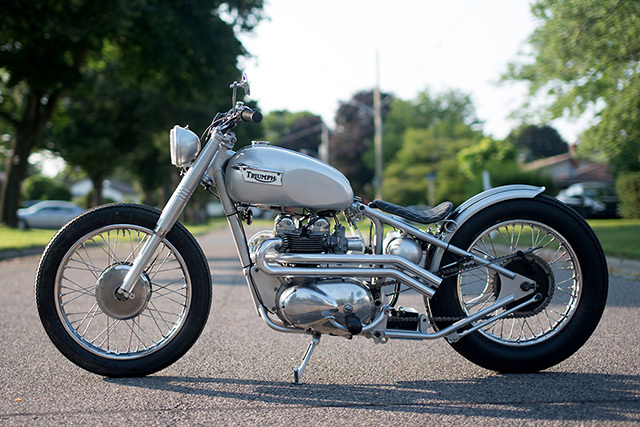 The oil tank itself is a TFMW item that has been painted silver, which next to the velocity stacked carbs and polished cases gives the engine an old school minimalist look that I personally could look at and appreciate for hours… imagine how good it sounds! The “pristine” tank that came with the bike turned out to be a total nightmare, sandblasting revealed a wreck, dings and dints had been filled and one lump of bondo measured four inches deep. For a builder of Chappell’s quality there are no cutting corners, so an expensive session on eBay had a much better condition unit on its way. 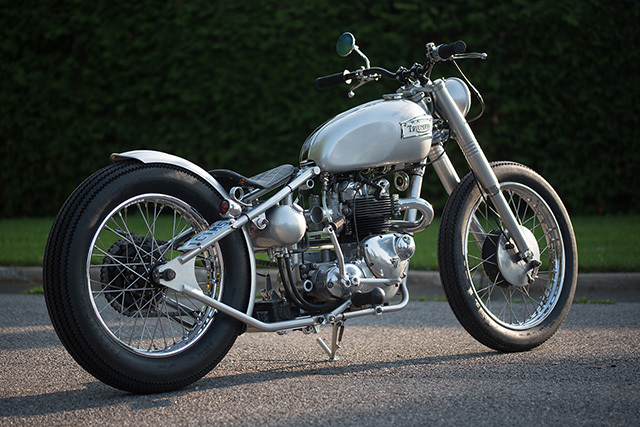 Factory badges and a lightly sparkled silver paint with black stripping over both the tank and fender are understated but enough of a detail to give passers-by a hint that this is no factory restoration. The bobber seat is from the Chappell brothers company Tuffside, black with white diamond stitch and old school spring struts. 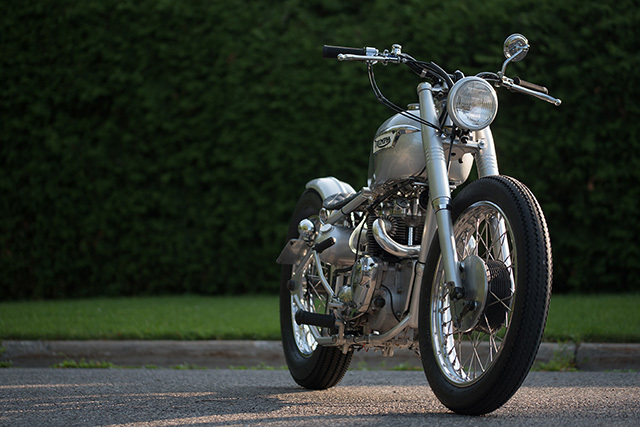 There are no ape hangers here; a build of this quality doesn’t need anything over the top to the catch attention so Biltwell risers hold some flat track bars with Biltwell kung-fu grips and polished stock controls. 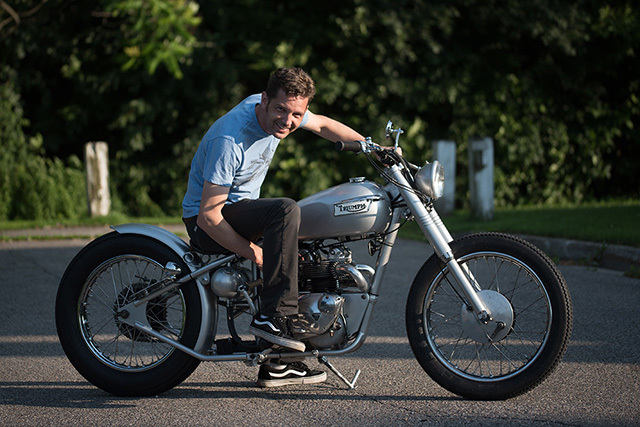 Rob always gives his bike a full rewire for flawless operation and a small headlight and side mounted tail light do their job without interfering in the ultra-clean classic lines. With the Triumph Daytona 500 finished it’s no surprise to see Rob sit aboard with a proud, broad smile. Many builders choose a bike and then throw a whole catalogue of parts at it, but Origin8or Cycles and Rob Chappell can make a crazy custom or like this build pay tribute to a classic in a subtle way that screams the sort of understated craftsmanship that makes him one of the best builders around.